MIDORI SCALP BALANCE MASK (1) 300ML – HAIRDEPOT - Hair & Scalp Care Products, Prevent Hair Loss, Shampoo, Conditioner, Treatment, Styling, Appliances and more! Midori Scalp Balance System 1 Nourishing Hair Mask for natural thinning hair. 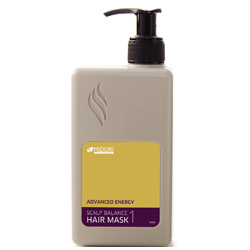 This hair mask delivers deep repair, conditioning, manageability and smoothness. Protects natural thinning hair against damage to promote longevity and vitality. 3Water, Cetyl Alcohol, Cetrimonium Chloride, Cetearyl Alcohol, C12-15 Alkyl Benzoate, Behentrimonium Chloride, Panthenol, Fragrance, Hydrolyzed Wheat Protein, Phenoxyethanol, Ethylhexylglycerin, Climbazole, Lactic Acid.